Subscription boxes are a huge trend in marketing, allowing consumers to try a sample of a product or a range of products each month. Knitting subscription boxes give you the option of trying mini skeins of a variety of yarns and getting full skeins along with a pattern, among other options. It's fun to get these boxes because it's a great surprise to see what you got, but if you're picky -- or don't love figuring out what to do with tons of tiny skeins of yarn -- these programs might not be for you. But you can combine the element of surprise from these boxes and the goal of using more yarn from your stash by building your own knitting subscription boxes. Combine yarn, a pattern, and other supplies in a box or bag, mix them up, and choose one at random to work on every month or whenever you need a new project. We'll take you through the process of making one of these boxes, which you can repeat as many times as necessary. Make enough for the whole year or just get some yarn you love but haven't yet worked with into your rotation. The first step, then, is finding the yarn you want to use in your project box and figuring out what you have. For an example, we picked a lovely Ella Rae Kamelsoft (which has been discontinued). 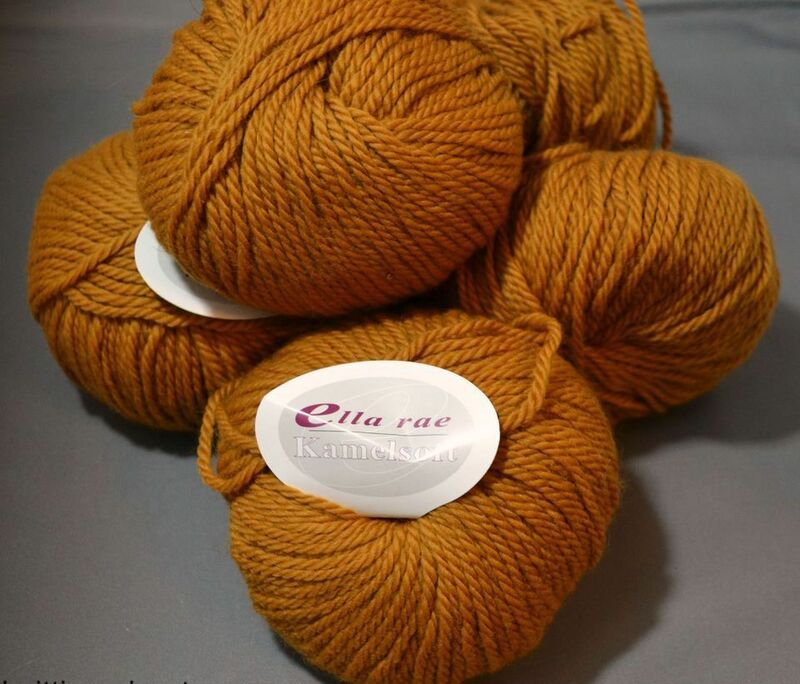 It's also good to know that this is a slightly heavy, worsted weight (the ball band calls for size 9 US needles), and it's a blend of 75 percent merino and 25 percent camel. If a yarn has been in your stash for a long time and doesn't have a label anymore, you may not have all this information, but there are ways to measure your yardage at least. You can use a wraps per inch tool to determine the yarn weight. Once you have some basic information about the yarn you want to use in your "subscription" box, it's time to find a pattern to knit with it. Sometimes we buy a yarn and know what we want to do with it, even if we don't do it right away, so this might be as simple (or not-so-simple) as finding the book or magazine where the pattern was that you wanted to knit. Assuming you have no real idea what you want to make, it's time to head to Ravelry. If you know the yarn you have, you can search for it, then click on the tab toward the top center of the screen that says "pattern ideas." This will show you what other people have made with the same yarn. A search for Kamelsoft brought up 22 projects making Bella's Mittens by Marielle Henault, which are lovely, long, cabled mittens that use, on average, two balls of yarn. Another popular choice is Jared Flood's Quincy hat, which also uses two skeins and has been knit in this yarn by 8 people; 6 also used it on Flood's Turn a Square Hat, which involves stripes and would be a great way to use up some other yarn as well. If you don't see something you like there, you can browse more widely. If you have an idea as to what sort of item you might like to make -- a scarf, say -- you can browse scarf patterns and narrow them down by yarn weight and whether the pattern is free if that matters. My search for free, knit, worsted weight scarves that use 300 to 450 yards of yarn gave me 505 results, which should keep me browsing for a while. As you start to browse you might come up with more attributes that are important to you, and you can add those in as you go. And if you don't know at all what kind of garment or item you'd like, you can search all those above attributes but leave out scarf. That search gave us more than 2,000 options, and that's just for free patterns. Let's say just for fun that we chose the Malabrigo Waffles Scarf by Sarah Florent. It calls for between 325 and 432 yards of yarn and size 8 US needles. The pattern is free, has four stars and has been knit more than 600 times. Sounds good. Once you have your yarn and pattern picked out, you can assemble your knitting subscription box of a sort. Check your pattern for the size of needles called for (there may be multiple sizes and/or lengths depending on the project) and any notions you might need like buttons, a cable needle or a stitch holder. Gather all of these things together in a bag or box. If you're doing a bunch, try to make them look similar, or if you have enough project bags you can put one in each, just don't pay too much attention to what goes in which bag. The reason for this is to keep the element of surprise that is one of the things that makes getting knitting subscription boxes so fun. If you don't care about that -- or you have certain projects you know you want to do at certain times of year -- you can plan out which ones are for each month or the order in which you want to work them. However you do it, making your own subscription boxes is a fun way to use up your stash and give yourself a little gift of things you might have forgotten you already had.